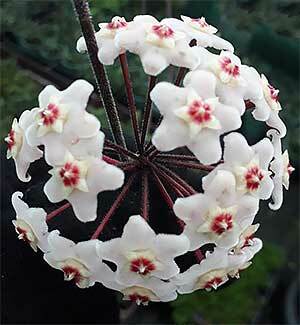 Hoya Plants are sometimes referred to as ‘wax flowers’ Hoya carnosa and Hoya kerrii being two popular species. An evergreen shrub or climbing plant that need a warm climate to perform well outdoors but are an indoor favorite and relatively easy care. Many species and cultivars are available for sale including H. Bella which is well suited to growing in a hanging basket and H. lacunosa with its creamy white flowers, these are two very fragrant species and are both excellent indoor plants. Fragrance can be a little strong so try a patio area. Hoyas being so varied will require slightly different growing conditions depending on species and cultivar. Some prefer more sun than others, although most prefer good filtered light rather than deep shade. Some species will grow better in cooler climates than others and these include, H. globulosa, H. sheperdii, H. diversifolia H. carnosa and H. pubicalyx. Our own Hoya australis is another. A magnificent species is H. multiflora, the ‘Shooting Star Hoya’, from Malaysia and the Philippines this species requires humidity and tends to grow more like a shrub than a climber. Excellent as a house plant. A tropical climbing, hanging or shrubby plant native to Asia, India and China, Hoyas are widely grown as indoor plants in hanging baskets. Also grown using a ‘trellis’ or ‘ladder’ that will support the plant as a climbing plant. Hoyas are fragrant and the waxy flowers are attractive. They prefer a well drained potting mix and are best left until ‘potbound’ this seems to improve flowering. So don’t overwater, but don’t let them dry out, remember that Hoyas like a bright position. A plant moisture metre is a good idea for Hoyas. Also known as ‘Wax Flowers’ Hoyas require a similar potting mix to orchids and bromeliads, and like these two Hoyas prefer to be under potted rather than over potted. Hoyas are epiphytes are were originally found growing on trees where they have excellent drainage, poor drainage will kill Hoyas especially in winter. They are also best kept in indirect light. Some species have a climbing or trailing habit, Hoya shepherdii and Hoya longifolia are climbing types with long thin leaves, originally from the Himalayas, fragrant white flowers and excellent in a hanging basket where instead of climbing they can be allowed to cascade down, both do well in cooler climates. Hoya nicholsonii is one that requires a warmer climate than some, but has wonderful pale yellow flowers, originally from the Philippines. 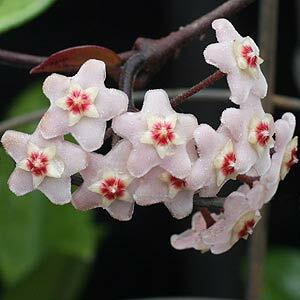 Hoya obscura is a fast growing free flowering species also from the Philippines. Yellow Leaves are usually caused by to much exposure to sun or lack of fertilizer and water. Mealy Bug love Hoyas they can be wiped away with a cloth with some metholated spirits on it. Snails can be removed by hand in most cases. Over potting and under potting, Hoyas do not like to have to much extra room in the pot, so try to keep them tightly potted but not potbound. When repotting do not disturb the root systems, they do not like it. Hoyas are easy to cuttings from and grow well indoors, if you are growing them in a hanging basket try planting 2 or 3 plants in the one basket so that root system is confined. When grown as a house plant, artificial light is suitable, so maybe in cooler climates an enclosed patio with some grow lights could provide a suitable growing condition. In the warmer months Hoyas can be moved outdoors. With so many different types of Hoya plants for sale ranging from some species found in Northern Australia with others through Asia remember that some species and cultivars will cope well with cooler climates than others. Hoya macgillivrayii is a climbing type from Northern Australia, lovely deep crimson red flowers. Hoya diversifolia is from Indonesia. To select the best species for cooler climates check the the parentage. The most widely grown species are Hoya carnosa, lots of cultivars with flowers ranging from white through to red and Hoya Kerrii or the ‘Sweetheart Plant’ with its heart shaped leaves.